The villa is just 150 meters from the beach on the bay “Cap Blanc” in a very quiet residential area. It’s only 1800 meters walk to Moraira where you can enjoy socializing, shopping, restaurants, great bars, beautiful marina, nice market, and so on. Delicious And there are also many sports facilities, including a golf course, diving or just swimming in the sea. The sea temperature is even in the preseason for 22 degrees! Directly around the house you can walk through nature and enjoy the peace. And less than 300 meters are a number of nice restaurants! And every morning there was hot bread just around the corner available. 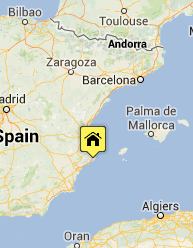 Moraira Villa is easily accessible from the airport, located just 90 km Alicante, but also with the car it is fine to do. The villa is located on a quiet cul-de-sac, surrounded by beautiful pine and palm trees. The district consists of all different villas, nice large pieces of pieces of land and privacy. There is ample private parking. 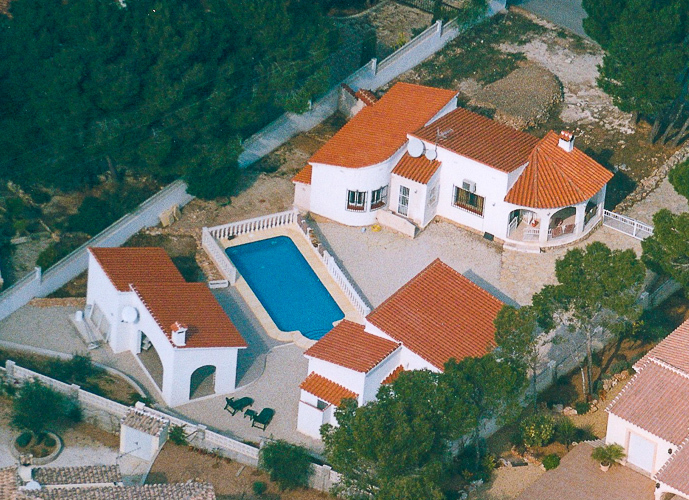 “Villa Moraira” consists of a main house, a second covered outdoor kitchen, a caretaker’s cottage and a private pool. The entire complex is on one floor. The pictures on this page. The “main”, the villa consists of a cozy living room with French doors to the veranda where you can sit and enjoy the morning. Your breakfast in the morning And later in the day this porch provides a pleasant shade. There are two spacious double bedrooms and a smaller bedroom with bunk beds. A total of six or seven people overnight. Particularly to the villa is that it has two kitchens. In the villa there is a common kitchen. Truly unique is the Spanish “outdoor kitchen”. This outdoor kitchen is wonderfully spacious and almost all amenities, including a BBQ area, a fireplace, microwave, oven and so on. The kitchen is integral with a large covered terrace with a nice big table where you can dine extensively. The managers stay basically in the caretaker’s house, but you will also not notice. The pool is centrally located on the property, giving you the peace and enjoying a glass of wine now easily see how the kids have fun at the pool. Moraira is easily accessible on foot on a nice flat path along the coast. On this road are numerous shops and including a diving / kayak rentals and a fitness center. The village of Moraira is very cozy with lots of cozy and good restaurants where you can enjoy. Delicious affordable Going to cost on average 50 percent less than in the Netherlands! Eating The offer is varied: of course there are several places to eat Spanish tapas. But a quick burger or a full fancy dinner. It is all possible. What Moraira is particularly attractive is that there is no high-rise buildings. So no second Benidorm with its bustle and noise in high season. The whole village is pretty flat, so it is good to walk on. There are lovely well maintained parks with colorful flowers. Visitors to Moraira be described as a lively mix of all ages. For children there is plenty to do in the area, such as a water / amusement park, zoo and fairground. (Later we will add more hints for day trips).